Two years ago Twitter started letting its users create polls for just about everything, making it easier for them to learn whether their followers prefer Westworld or Stranger Things, or decide whether they should have beef bourguignon or Cinnamon Toast Crunch for dinner. And now, at last, Facebook is getting in on the polling action as well. 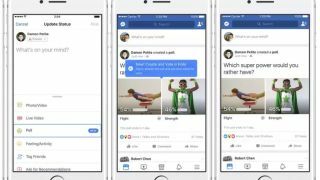 As of today, you can log onto Facebook and make a poll of your own, no matter if you're using a desktop browser, iOS or Android. On a desktop browser, use the usual interface to write a new post, and in the bottom menu that pops up for adding Photos, Check-Ins and the like, you'll see a new option to make a poll. The question itself can be as long as you want it to be, and, in contrast to Twitter, you can add photos and GIFs for each option that make it easier for users to decide what they like. Unfortunately, unlike Twitter, you can only create polls that let users choose between two options. (Twitter allows for four.) The options themselves are limited to 25 characters. Unlike Twitter, the polls also aren't anonymous, so you'll be able to see who voted for what by clicking on the number of votes in the lower right-hand corner. I don't see that causing a problem. No-siree. Considering that Facebook is currently involved in a massive investigation regarding how extensively its policies influenced the polls in the last US presidential election, the timing is interesting, to say the least. But neither is it entirely unexpected, as Facebook recently added polls to Instagram stories. Enjoy the feature for now. Just keep in mind that it probably won't be long before your reclusive relatives are posting polls that might make you cringe. Need a new tablet? Here are the best Android slates around!